A member of the clearwing moth family, the dogwood borer, Synanthedon scitula (Harris), is one of the most destructive pests of flowering dogwood, Cornus florida L., affecting plantings in homes and parks (Johnson and Lyon 1991). It is also an important pest of many other ornamental, fruit, and nut trees. Cultivated trees are usually more heavily infested than those in wood lots. Figure 1. Damage caused by clearwing moth larvae. Photograph by University of Florida. Found in eastern Canada and in the United States, where it is widely distributed east of the Mississippi. 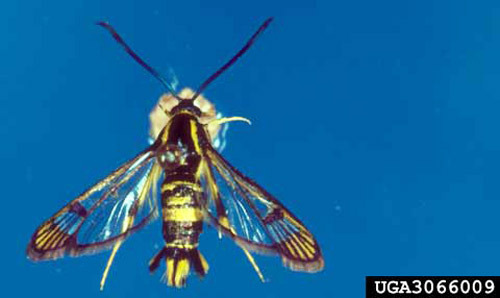 Adult: Dogwood borer, a clearwinged moth, has a wasp-like body, approximately 1 to 2 cm (1/2 inch) long. Adults are bluish-black with a yellow band on the second and fourth abdominal segments. Figure 2. Adult female dogwood borer, Synanthedon scitula (Harris). Photograph by James Solomon, USDA Forest Service, www.forestryimages.org. Figure 3. Adult male dogwood borer, Synanthedon scitula (Harris). Photograph by James Solomon, USDA Forest Service, www.forestryimages.org. Eggs: Eggs are small (0.6 x 0.4 mm = 0.02 x 0.02 inch), oval, and marked with hexagonal pattern of slightly raised lines. Initially pale yellow, the eggs turn darker with development. Larvae: Larvae are cream-colored with reddish-brown heads. Additionally, there are two reddish brown spots on the prothoracic shield. Larvae grow to a size of over 15 mm (0.6 inch) when fully grown. Pupae: The light brown pupae are 10 mm (2/5 inch) long and inside a cocoon made of silken thread and frass fragments. Adults emerge in spring and females lay eggs singly on the bark, preferentially on injured areas. In apple, burr knots (aggregations of partially developed root initials at or below the graft union) are attractive egg laying sites. Eggs hatch in about eight to nine days and larvae enter the bark wounds and form large feeding galleries. It takes approximately a year for larvae to pass through seven instars (Bergh and Leskey 2003, Neal 1984). Larvae overwinter underneath the bark and resume feeding when temperatures reach above 7 to 10°C (45 to 50°F). In the spring, larvae construct dark brown cocoon of silk and frass near the surface for pupation. 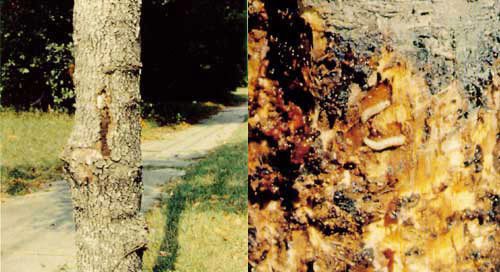 Pupal stage generally lasts a month and empty pupal cases remain visibly protruding from the bark. Adults are swift flyers and most active at dawn and twilight (Anonymous 2000). The typical life cycle consists of one generation per year but some larvae in cooler climate have been suspected of taking two years to complete development (Reidl et al. 1985). More than one generation per year (multivoltine) may occur in Georgia (Snow et al. 1985). Borers are found at various stages of development throughout the year. 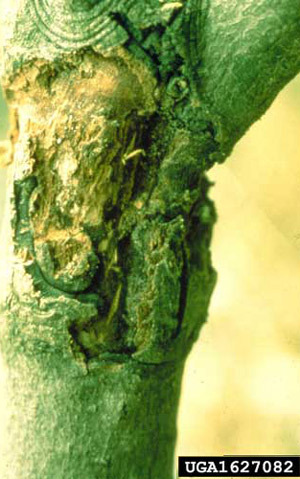 Dogwood borers attack a broad range of ornamental, fruit, and nut trees but have increasingly caused problems in apple orchards in the northeastern United States since the 1980s (Bergh and Leskey 2003). Other hosts include, American beech (Fagus grandiflora), black willow (Salix nigra), blueberries (Vaccinium spp. ), American chestnut (Castanea dentate), hickories/pecans (Carya spp. ), pines (Pinus spp. ), mountain ash (Sorbus spp. ), hazel (Corylus spp. ), birch (Betula spp. ), loquat (Eriobotrya japonica), oaks (Quercus spp. ), and elm (Ulmus spp.). The dogwood larvae bore into the wood cambium. Infested parts appear swollen, knotty, calloused or gall-like. Feeding is mostly confined to the burr knot but once the burr knot area is consumed, it moves to the adjacent areas. Sloughing of wood bark is an early symptom of attack. Other symptoms include sawdust-like frass being pushed out of the burrows, and leaves turning red prematurely. Figure 4. Damage caused by the dogwood borer, Synanthedon scitula (Harris). Photograph by John A. Weidhass, Virginia Polytechnic Institute and State University, www.forestryimages.org. Figure 5. Damage at rootcollar of flowering dogwood, Cornus florida, caused by the dogwood borer, Synanthedon scitula (Harris). Photograph by James Solomon, USDA Forest Service, www.forestryimages.org. Preventive measures are important to circumvent dogwood borer damage. Any physical injury to the plant, especially by lawn mowers must be avoided. Newly planted trees need to be braced for protection against wind. Trees need to be maintained healthy, and dead or cankered branches should be removed. Tree wraps have variable results and in some cases use of vinyl tree wraps around the trunk of young dogwood trees actually increased dogwood borer infestation (Owen 1991). Insecticides with more residual activity (long lasting effect) are being applied on the lower trunk and burr knots. For specific insecticide recommendations, contact the local office of your county Cooperative Extension Service. Natural control also takes place, although the level of control achieved may not be adequate. Natural predators that eat larvae and pupae include woodpeckers and nuthatches. Adults are eaten by birds, bats, spiders, and other insect eaters. Anonymous. (2000). Fruit IPM Factsheet: Dogwood Borer. Michigan State University Extension. 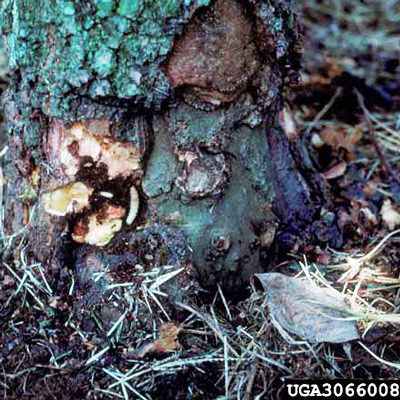 https://www.canr.msu.edu/ipm/diseases/dogwood_borer (24 January 2019). Bergh JC, Leskey TC. 2003. Biology, ecology, and management of dogwood borer in eastern apple orchards. The Canadian Entomologist 135: 615-635. Bergh JC, Leskey TC, Zhang A. 2004. Discrimination by male dogwood borer, Synanthedon scitula (Lepidoptera: Sessidae), among traps baited with commercially available pheromone lures. Journal of Economic Entomology 97: 344-352. Brown LN, Mizell III RF. 1993. 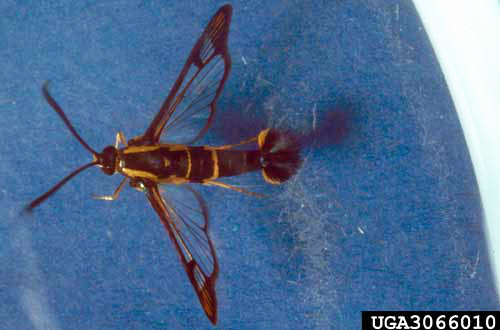 The clearwing borers of Florida. Tropical Lepidoptera 4, supplement 4. Neal JW. 1984. Bionomics and instar determination of Synanthedon rhododendri (Lepidoptera: Sesiidae) on rhododendron. Annals of the Entomological Society of America 77: 552-560. Owen NP, Sadof CS, Raupp MJ. 1991. The effect of plastic wrap on borer incidence in dogwood. Journal of Arboriculture 17: 29-31. Riedl H, Weires RW, Seaman A, Hoying SA. 1985. Seasonal biology and control of the dogwood borer, Synanthedon scitula (Lepidoptera: Sesiidae) on clonal apple rootstocks in New York. The Canadian Entotmologist. 117:1367–1377. Snow JW, Eichlin TD, Tumlinson JM. 1985. Seasonal captures of clearwing moths (Sesiidae) in traps baited with various formulations of 3, 13-octadecadienyl acetate and alcohol. Journal of Agricultural Entomology 2: 231-232. Photographs: James Solomon, USDA Forest Service; John A. Weidhass, Virginia Polytechnic Institute and State University. Publication Date: May 2006. Reviewed: January 2019.